5 Garden Myths | Faddegon's Nursery, Inc. Sometimes yes, many times no. 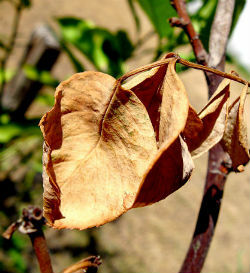 There are many factors that can inhibit a plants ability to thrive and very often it has nothing to do with feeding. It might seem harmless to try feeding first, but this can actually make the problem worse by causing the plant to use energy it could better use growing roots or building up its defenses against disease. If a plant is showing signs of poor growth the factors to look at first are soil health (pH), improper planting, improper light exposure and watering practices. Just because a pesticide is organic doesn’t necessarily mean there are no risks in using it. Think of all the substances that are natural and yet dangerous. Many plants on their own can be toxic; foxglove, oleander and many others can be poisonous if ingested by people or pets. Organic garden products are definitely better for all of us, but only when used as intended. Check beyond the label on the front of the package for warnings and take them seriously. Whenever you can use a method such as removal of pests by hand, insecticidal soap or Bacillus thuringiensis, it’s usually a better choice. Plants such as Azaleas, Blueberries and rhododendrons love soil that’s acidic, but adding coffee grounds to make it so isn’t the best method. Coffee Grounds will work very slowly and while decomposing will use the available nitrogen in the soil thereby depriving the plant. A much better solution is to use a soil acidifier intended for plants. The idea behind putting small stones in containers is to create good drainage for plant roots so they aren’t sitting in water. Unfortunately, adding small stones does just the opposite. The stones will actually hold water as it comes down through the soil creating pooling. A reliable potting mix by itself is the best drainage for the plant. It should be light enough to do the job on its own. The objective of selecting drought-tolerant plants is to lower your garden water needs, not eliminate them altogether. All plants need attention paid to watering particularly when first installed. Roots need extra help finding their way to natural water sources in the ground. As they mature, plants that are drought-tolerant will need less water than other plants and some may reach the point that you never have to think about their water needs, but they also will never be cactus unless they are cactus.